Overall a great, awe-inspiring stick that will suit not only the advanced player looking for a big curve higher up the stick but the keen club player who isn’t fascinated with drag flicking. You can command the ball and the respect of others carrying the Gryphon Tour Classic on to the field. Picture it, you are on tour in imperial India, the huge, relentless golden sun is beating down on you like a chicken drumstick on a BBQ. Huge crowds of locals have assembled behind the opposition’s goal, cheering and dancing. You call encouragement to your teammates and line up to receive the push back. The ball comes to you at pace, slightly off target. You move and reach to receive it and your beautiful green and gold Gryphon Tour Classic Curve hockey stick takes instant control of the ball. You sweep the ball away accurately to the wing, it comes back to your stick close to the oppositions 25 and seemingly effortlessly you dribble through the two central defenders and smash the ball past the goal keeper in to the roof of the net. Holding your Gryphon Tour Classic Curve aloft, like a warrior holding the head of its victim the crowd is silenced, in ore of this quality player and the marvel of the stick that has made it possible! Providing a review of the Gryphon Tour Classic Curve instantly conjured this image for me. The colour design of the stick in Green and Gold with wonderful white leather handle contrasting so elegantly to the shaft just screams of imperial class and sophistication. Gryphon have the old school British Empire design down to a tee, while in more recent models providing the modern touches which really make the Classic Curve standout as one of the best hockey sticks available. “The sophistication of the Gryphon Tour Classic doesn’t stop at the design and the look and wonderful feel of the handle. 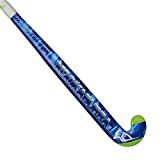 Unlike some hockey stick brands Gryphon’s top of the range Tour Classic chooses a more refined midpoint shaft bow at 300mm which is contrary to other brands obsession with concentration most of their technology in to their low bow hockey sticks. At least 80mm higher in the stick than low bow models the curve in the Gryphon Tour Classic is designed to assist playmakers rather than drag flickers, which I know is the more showy shot but is not all that hockey is about. It’s also notable that while the bow isn’t shallow, the 23mm curve in the Tour Classic is not over the top, it certainly struck me that Gryphon have focused on a different type of player for their top of the range stick. “Gryphon’s oversized maxi head is a playmakers dream giving a fantastic balance between dribbling, protecting the ball and catching the sweet spot with the enlarged hitting area. Talking about hitting the Gryphon feels powerful. Yes it’s stiff, no we don’t know how much carbon and aramid is in it either as our friends at Gryphon doesn’t believe we need to know but it hits the ball hard as hell. All of Gryphon’s range of sticks are designed with power in mind, the Tour Classic Curve feels chunky and solid to hold but with a subtly to it that makes it feel reactive too. One of the many outstanding pieces of technology that I picked up on in my review of the Gryphon Tour Classic is the silicon sleeve technology, which is under explained (thanks marketing team) but should not be under estimated. I didn’t have too long with the stick as the guy who I talked in to letting me have a play was watching over me like I was taking his daughter on a date but from the time I had with her I noted a feel I haven’t yet experienced from many of the stiffer sticks. This “feel” was of a slightly softer hitting experience in particular and it did seem to dampen the vibrations up the shaft when I caught more ground than ball (sorry Robert). For me the two best features in my review of the Gryphon Tour Classic are the curve position and the handle. The curve is noticeably bent without being too low and obvious like in the low and extremely low versions of many hockey brands sticks. This curve gives enough to make quick drag passes fast, powerful and accurate without being distracting for a moderate player like me still craving straight mulberry sticks. And the handle is not one of the most technical features of modern composite hockey sticks but the Gryphon Tour Classic has a handle that feels (and looks) fantastic. It feels thick, it sticks to your hands but is easy to change hand positions and looks awesome in white, especially against the green and gold of the Tour Classic model. For clarity my review here is in direct response to a quick play with the 2014 model of the Gryphon Tour Classic. This model is distinguishable for the small “Tour CC” written on the front of the stick rather than the newer model with the elongated “Gryphon” wording on the front. I will review the newer model in due course but some of the pricing I’ve seen available for the 2014 stick makes it a really attractive purchase.